In May of each year we celebrate the finding of the Holy Cross. At the time of our Lord crucifixion was a shameful death--reserved by the Romans for convicted criminals. So the cross on which our Lord died was not preserved by the Apostles as something to remember Him by. It was in the fourth century that the Emperor Constantine abolished the use of crucifixion in honor of our Lord, and the cross became a respected symbol of the Catholic Faith. Around 325 AD, Constantine's mother, Saint Helena journeyed to Jerusalem to search for the Cross, which now would be honored as a sacred relic. It is said that she was able to identify our Lord's Cross amid several others by the miraculous healing of a sick woman to whom the Cross was touched. She ordered the demolition of a shrine to Venus that an earlier Emperor had built on the site of the crucifixion, and ordered the construction of a church under the title of the Holy Sepulchre, where a portion of our Lord's Cross was placed for veneration by the faithful. The other part of the Cross returned with her to Rome, together with the nails of the crucifixion. In the year 610 AD the Persians invaded North Africa and the Holy Land, conquering Jerusalem, burning the church, and taking the Holy Cross with them back to Persia. The Emperor Heraclius attempted to arrange a peace treaty with the Persians, but their many victories made them too arrogant to negotiate. After a long period of prayer and fasting, Heraclius assembled an army and joined battle with three of the Persian Generals and conquered their armies. The son of the Persian ruler, angry that his father had appointed his younger brother to take over the rule put both his father and brother to death, and then negotiated with Emperor Heraclius. As part of the peace settlement, Heraclius demanded and received the return of the Cross. He determined to carry it to the place of the crucifixion on Mount Calvary, and dressed in his finest gold and jeweled robes, assembled an entourage to make the trip. 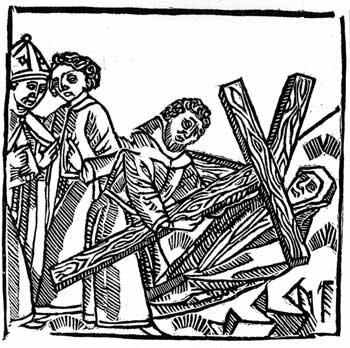 But a strange thing happened—no matter how hard Heraclius tried, he was unable to carry the Cross up the relatively small incline. Ultimately, Zacharias, the Bishop of Jerusalem approached the Emperor and suggested that he would better imitate our Lord if he were more humbly dressed—certainly Jesus Christ did not go about in such clothes. On swapping clothes with a humbly dressed beggar, Heraclius easily carried the Cross to the place of the crucifixion, where he ordered the reconstruction of the church of the Holy Sepulchre to house the Cross once again. As I said earlier, the Holy Cross ought to inspire us to imitate the humility of Jesus Christ. Jesus was God—the Son of God. He humbled Himself by taking our human nature and being born amongst us. Bishop Sheen used to say that this was somewhat like a man who loved dogs so much that he actually became a dog, walking about on all fours, eating dog food from a bowl, and sharing the other dogs’ fleas. Jesus humbled Himself in order to join us in all the difficulties of the human condition—even to the point of enduring a terribly painful death. None of this was required of Him—He could have lived in a palace. He could have worn god and jewels like the Emperor. Indeed, He could have redeemed the human race just with an act of His will, while enthroned with His Father in Heaven—no need to share our fleas! But, in fact, He did humble Himself—so that we might come to know the importance of humility. We must be humble, first of all, before God. Greater than the greatest of men, He commands our respect even more than we would respect any earthly official—president, Pope, governor, or king. This is why we genuflect when we enter and leave His Eucharistic presence, why we wear our best clothes to Sunday Mass, why we spend our time in respectful silence, and why we concentrate our minds in prayer. We ought to remember that we are always in the holy presence of God—God is everywhere, not just in the Blessed Sacrament and the body and blood of Jesus—so we ought to be humble and prayerful in every time and in every place, all of the days of our lives. As well, we must be humble with all of the people with who we deal: friends, family, co-workers, shop keepers, and so forth. Humility with others is very important, for as soon as we start to think that we are better than someone it becomes easy to sin against that person. It is easy for a self-important person to think he has a greater right to another persons’ money and property, to think that the other person has no right to the truth, to think that the other person has no right to bodily security, to think even that the other person has no right to the integrity of his family. “I am going to take his money, his car, maybe his life, and even his wife,” thinks the self-important person. And remember that false humility is not humility at all, but rather, a form of pride. The truly humble person does nothing to show off how humble he is, and never boasts about his inabilities. God should be ever on our minds. At least figuratively, we must never take our eyes off the Cross of Jesus Christ. And as we gaze upon the Cross we should be ever mindful that as our Lord humbled Himself for our redemption, so too must we humble ourselves to benefit from that redemption and to strive for our eternal salvation.